Donuts back east meant Dunkin’ Donuts, and donuts in the Seattle area mean Krispy Kremes. This was a hard one to avoid, especially since there is a drive-through not far from our path home when I shop big. I am guilty of bringing them to class as birthday party treats when the kids were younger. No more though. I purchased this mini-donut maker on eBay – risky, but it worked out. I tried the donut pans that go in the oven, but it was tough to get them stick-free – place lots of clarified butter in the donut circles in the pan. This mini-donut maker is made by a company called Maxim, but don’t do a web search on this company with kids around – the donut maker isn’t made anymore from what I can tell. If you found a good donut maker, let me know. 12/1/09: King Arthur sells a mini-donut maker. Thanks, Holly! I use this recipe for waffles as well (in a waffle iron), so I’ll post my waffle recipe another time. This was S’s (my younger son) suggestion – “hey, use the waffle recipe in the donut maker!” Brilliant idea, since we like the waffles too. Note: If you're following SCD, don't use chocolate (in the photo). Whisk together all the ingredients well. Pour the batter into the donut circles in a pan or donut maker. Fill almost to the edge and then close the lid on the donut maker. Whisk the batter between batches. If you are baking them in the oven, preheat the oven to 300 degrees F, and then bake the donuts in the oven for about 20 minutes, or until they begin to turn brown. In the donut maker, they only take about 3 minutes or so before they are ready, and this depends on the donut maker as well. Once they are cooled, you can top with honey and cinnamon, toasted coconut, chocolate, maple syrup, dip in ice cream or yogurt, or just eat them plain! I sometimes sneak chocolate chips in the donuts before I cook them to give them a bit of a chocolate filling. Wondering if this would work with/for cupcakes? I’m not sure since I haven’t tried it. I will be posting a recipe for fluffy cupcakes over this weekend , which might be more of what you’re after. Let me know if you try it. Oh My, I can’t wait to try these! thanks for a beautiful website with so many recipes. I feel like I have found a lost treasure chest. Karen, let me know what you make them in – I’m always on the lookout for a good donut maker. Yeah thanks…now I’ll be obsessing over how I can find a donut maker! We haven’t had donuts in over 18 months. What a fun recipe (and might be another way to sneak carrots into my sons diet). Sorry, Tracee… not really :). I’m thinking of trying this recipe with almond butter to get a fluffier outcome. Do you think this would work well deep-fried like real donuts? Not sure, but a very interesting question. As long as it can rise a bit in the oil, it seems like it would work. Michelle – funny you mention that. I was thinking about it a while ago and then forgot about it. It would probably work well. Stay tuned! do have the cal count for doughnuts? You can find a lot of nutrition calculators online. I use the one at caloriecount.about.com all the time (http://caloriecount.about.com/cc/account/flog_add.php?tab=new_recipe). Occasionally you’ll have to guide it to the right food — like choosing one almond flour brand over another — but it’s remarkably good at guessing. Wow these look good. Do you have any good glaze recipes to drizzle over these? Do you think this recipe would work with an aebleskiver pan? Yes. So jealous that you have one! Is it “stick-free”? You do need it to be non-stick, like waffle irons and donut makers. hmm. I’d definitely grease it generously. I just made these and they are pretty good. A little too much egg taste so I will try to tweak it. Besides that they are really good. Thanks for the recipe! as far as taste/texture goes, can you tell me the difference between your almond flour donuts and your coconut flour? thank you! Could you do this in the oven? I don’t have a donut maker. For the person asking about using an abelskiver pan, this works great but make sure you turn them frequently to avoid burning. I made them and cooked them with a bit more honey and vanilla and added some scd jam in the centre as they cooked so they come out like filled doughnut holes. thanks Monique. I’ve been wondering if they would work. Made waffles out of this recipe and both my children loved them! I an thankful I found this web site and for Pinterest to help change us over to gluten free! I was surprised at how well these baked up! They were nice, light, fluffy donuts in 20 minutes! My almond meal was pretty coarse, so I imagine these would have been even better with a more finely ground meal. I topped them with a glaze made of coconut oil, raw cacao, cinnamon, and a hint of agave nectar (I know, I know). Delicious! I used a nonstick donut pan that I got from bed bath and beyond and they came out perfect and sooo delicious!! Do you have a coconut flour recipe? I would love to make these for my kids for school, but the school is nut free. 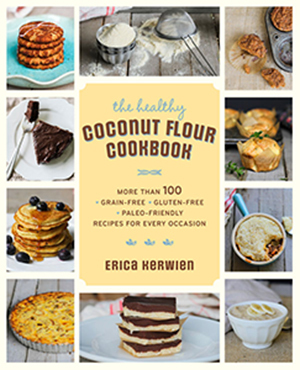 I have one on the site, search for “coconut flour donuts” which uses 6 eggs and I’ll have some new recipes in my coconut flour cookbook coming out next year. Hey, thank you for the great recipe. The donuts taste delicious, only one problem: they stick to the pan. I tried spraying with coconut oil spray- they stick, then brushing with coconut oil-they stick? Help please, I want to make them look perfect, not sure why they just keep sticking? Have you ever tried to make some sort of rainbow sprinkle to go along with the doughnuts? I gave made these a few times. Did not have luck with donut pan-stuck miserably even though non stick. Found donut maker up I our garage- sears brand. Worked great. Only can make 2 at a time. I have added SCD yogurt also. Made the batter a little easier to work with. Do you know if we can use date sugar? Bought some before my daughter developed crohns. Says dried dates that have been powdered. Bought at a health good store. I think it’s best to operate as if coconut sugar is not SCD legal because it’s made primarily sucrose (glucose and fructose), which is a double-sugar (which is not allowed on SCD). Forgot to mention they tasted great. Love your site!! Have had a lot of fun baking for my daughter. Thanks! For the pancakes, if you’re using my almond flour pancake recipe the batter is should be thick, so I would check the ingredients again. See the photo of the batter on the skillet – it sits in a thick circle. Is there a way to make these if you don’t have a donut maker? Looks really good! Ha ha so we have been using your waffle recipe for awhile and have also used it to make donuts. Now I see that it is actually a donut recipe to begin with! My kids call them waff-nuts. We melt down Lilly’s stevia sweetened Choc chips and dip one side in as frosting. It firms up great and gives it that Hostess Choc covered donut feel. Thanks for the great recipe. I’ve shared it and everyone loves it. Plus it’s so quick and easy. I’d like to recommend the spice mace to your recipe. I’ve been told it’s what gives plain cake donuts their flavor. I found bulk mace and gave it a sniff. Well I’ll be! Donut spice. Yummo! Could you fry these in oil like a real doughnut? This recipe looks a lot like your waffle recipe. Is it the same one? I’m thinking I will use my mini bundt pan and make these like fancy little muffins. I baked mine in a donut tray and they turned out perfect!! I sprayed some non stick spray to keep them from sticking. I used sugar free syrup and mixed cinnamon and stevia for the top. They were so yummy!!! Thank you for this recipe, I was craving donuts so badly but I am diabetic. Happy donut day to me!!! I thought that Chocolate was NOT SCD Legal. Correct, chocolate is not allowed on SCD. I made note of it for those who follow SCD. I just made a batch of these in my mini donut maker and they turned out delicious I topped some with icing, some with cinnamon sugar and some with maple syrup and my allergy free husband and kids enjoyed them too! Thank you soo much for this great recipe! I look forward to trying some more of your recipes.